After seeing Steven Spielberg's Jaws as a teenager, Steve Alten went straight to his local public library and checked out every book he could find on great white sharks. In those texts, he stumbled upon a black-and-white photo (seen here) of scientists seated in the massive, reconstructed jaw of a megalodon — the prehistoric cousin of the Great White shark, believed to have been extinct for more than two million years. The image of a 75-foot-long shark that could swallow a Volkswagen whole never left Alten's mind, and 22 years later he published his first novel, Meg: A Novel of Deep Terror, a science-fiction horror story about a prehistoric megalodon shark that rises from the depths of the Mariana Trench to hunt once again. Since 1997, a movie based on the novel has been stuck in development hell. Filmmakers like Jan de Bont (Speed, Twister), Guillermo del Toro (Hellboy, Pacific Rim), and Eli Roth (Cabin Fever, Hostel) were all attached to the film at one point or another. After Roth left the project due to creative differences in 2016, director Jon Turteltaub (National Treasure) stepped in to helm the endangered adaptation. 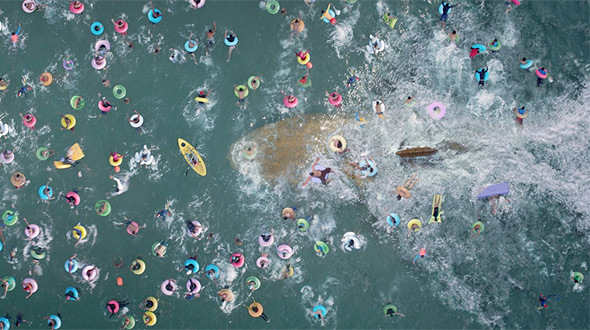 Enter The Meg, a big-budget Warner Bros production with an international cast and plenty of shark appeal. A deep-sea submersible from Mana One — an oceanic research institute off the coast of China — has been attacked by an unidentified organism and lies disabled at the bottom of the Pacific Ocean with its crew trapped inside. With time running out, former deep-sea rescue diver Jonas Taylor (Jason Statham) is recruited by a Chinese oceanographer, Dr. Zhang (Winston Chao) and Mana One station chief Mac (Cliff Curtis of AMC's "Fear the Walking Dead") to rescue the team trapped underwater. The setup is reminiscent of another Spielberg film, Jurassic Park, as we meet a billionaire investor Jack Morris (Rainn Wilson of The Office) who is financing the entire operation and wants to see it turn a profit. Aboard the Mana One, Jonas meets the rest of the team: Dr. Zhang's daughter, marine biologist Suyin (Li Bingbing of Transformers: Age of Extinction), lead engineer Jaxx Herd (Ruby Rose of Netflix's "Orange is the New Black"), medical officer Heller (Robert Taylor), and rover operator DJ (Page Kennedy). Also aboard the research station is Suyin's precocious eight-year-old daughter, Meiying (newcomer Sophia Cai). As the only deep-sea diver to survive a rescue below 10,000 meters, Jonas mounts a plan to recover the damaged submersible and its crew, but nothing can prepare the grizzled veteran for an encounter with "The Meg" — the titular, not-so-extinct prehistoric predator lying in wait. With a screenplay written by Dean Georgaris (Lara Croft Tomb Raider: The Cradle of Life) and Jon Hoeber & Erich Hoeber (RED, Battleship), The Meg is a fun throwback to '90s sci-fi action movies like Congo, Independence Day, Sphere, and Deep Blue Sea, anchored by a charismatic movie star in Jason Statham and computer-generated spectacle in the form of a 75-foot-long killer shark. It's almost like what Grindhouse would look like if it were a spirited homage to '90s blockbusters instead of '70s B Movies. It's simple, straightforward, and entirely unassuming, and unlike the needlessly dour Skyscraper, it's actually having fun with its utterly absurd premise. Jon Turteltaub assembled an impressive behind-the-camera team for his monster movie, including Oscar-nominated cinematographer Tom Stern (Changeling, The Hunger Games) and Oscar-winning production designer Grant Major (The Lord of the Rings series, Peter Jackson's King Kong). The result is a summer movie that is aesthetically pleasing without being brutally overblown and concussive in the way most modern blockbusters, like the Transformers movies or Warner Bros' DCEU movies, are. Is it silly? Absolutely. Does it know it's silly? One hundred percent. And yet, it isn't a full-blown parody like Alexandre Aja's Piranha 3D or deliberately dimwitted like SyFy's Sharknado movies. 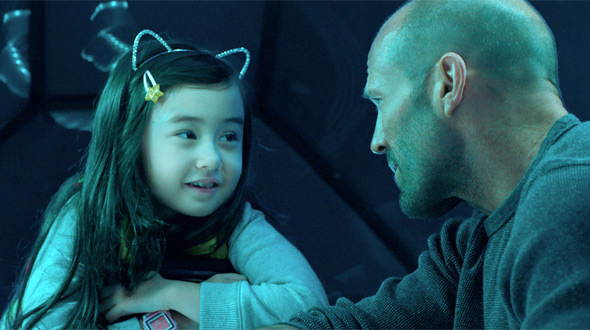 The Meg works in large part because of Statham, who walks the line between commitment to the role and winking to the camera effortlessly. It also helps that he has surprisingly strong chemistry with co-stars Li Bingbing and the adorable Sophia Cai. As for the rest of the team, they're barely there — more like rough sketches than three-dimensional characters. Rainn Wilson's smarmy billionaire delivers a bunch of jokes that don't land and Ruby Rose's edgy, punk rock engineer is on-hand to spout plenty of science speak, while Kennedy's DJ feels like he should be paying royalties to Deep Blue Sea's LL Cool J. But this is a monster movie, not a character piece. The humans are there to fight the giant killer shark or be eaten by it, and they fulfill their duties sufficiently. As for the titular star, the megalodon is appropriately menacing, but the monster is mostly restrained by the film's PG-13 rating. That's what holds The Meg back from being an all-time trash classic — it's just too damn conservative. For example, there's a brief scene in which the shark makes quick work of a giant squid. Why not give us an underwater kaiju battle between these two behemoths? Hell, throw some other prehistoric beasts in there to illustrate how the megalodon is the apex predator. In another scene, the shark heads toward Sanya Bay — one of China's most densely populated beaches — for a smörgåsbord. Sadly, we never get the money shot of the shark opening its maw and mowing through the crowded coastline, devouring hundreds of swimmers and colorful floats in one giant gulp. For a movie about a shark the size of an 18-wheeler, you'd think the body count would be higher; Michael Myers and Jason Voorhees rack up more kills in one movie than the Meg. Where's the blood!? All things considered, The Meg is still a fun popcorn movie that manages to be a better Jurassic Park sequel than Jurassic World: Fallen Kingdom. Turteltaub's competently crafted killer shark flick lacks depth but delivers real thrills and entertaining action set pieces. If it's successful, maybe Warner Bros will consider a crossover with their Godzilla, King Kong, and Rampage franchises and deliver an epic monster mash for the ages, complete with Statham and Dwayne "The Rock" Johnson teaming up to save the Earth from giant creatures. Hey, a guy can dream, can't he?